The War of the Spanish Succession was probably the world's first world war. It was fought in areas as far flung as the Seven Years War, which it preceded by fifty years. The war was fought between the French, and Spanish on one side, and the English, Dutch, and Holy roman Empire. It also had bit parts played by the smaller players that Europe abounded with at the time. Our story begins with Charles V of the Holy Roman Empire and Carlos I of the Spanish empire. Through his mother and father, he was the heir to both of these along with the Netherlands and more. His reign saw the house of Hapsburg become the world's greatest multi-national dynasty. The story continues until the late 1600s when Carlos II reigned over the Spanish empire. He was unfortunately childless and represented the last true Spanish Hapsburg. Leopold I (Holy Roman Emperor), and Louis XIV (king of France) were both grandsons of Phillip III of Spain. They, with their children, had the greatest claim to the throne of Spain. There was a third candidate who was very important to our story (but who unfortunately for the the people of Europe and beyond) that died young. This was Joseph-Ferdinand Wittelsbach of Bavaria. He was the son of the Elector of Bavaria and the grandson of Leopold I. There were treaties in force between the major powers that would make Joseph-Ferdinand the king of Spain after the death of Carlos II. His death in 1699 turned Europe into a powder keg waiting to be lit by whomever had the will to strike the match. Carlos II passed away, but before he did drew up a will. In it the Spanish crown was to be offered to a grandson of Louis XIV, the Duc D'Anjou. In the event that he or more to the point his grandfather turned it down it was to be offered to the Hapsburg Archduke Charles of Austria, son of Leopold I.
Louis XIV's and the Duc D'Anjou's (now Phillip V of Spain) acceptance of the crown struck the spark that turned into the aptly named War of The Spanish Succession. The book tells the story of the War, its military campaigns, political machinations, and final outcome. The war would see the rise of England to be a global power. It would also really be the last time the Netherlands was a top player in the world of European politics. France would be brought to the edge of ruin. This being my first review of a book, I wanted to delve into the physical makeup of the book itself. I have some books that I have owned for twenty years that look as bad as some hundred year old newspaper. They are yellow and falling apart. I'm not just talking mass market soft cover books, but hard cover. The older mass market books are only fit for the inside of a reptile's cage. So what does go into the making of a 'good' book that will see you through the years? Well I am here to tell you don't start your search using book making. At best you will find a plethora of hits on 'la Cosa Nostra' etc. As far as the actual pages turning yellow, it is a process that is well known for making our lives more miserable, oxidation. Lignin is found in all trees to varying degrees. It is actually thought to be the reason that trees can grow to great heights. If too much Lignin is in the book's paper, it will oxidize faster. Some book pages are now bleached to make the pages more white. This can break down the page's cellulose and also cause oxidation to happen faster. Book bindings can be either sewn or glued. Suffice to say that in my delving into this arcane study I did find out one thing. The books that Casemate publishing brings to the public are built to last. So, leaving the actual makeup of the book aside, let us start on the Mr. Falkner's part of this endeavor. Louis Le Grand was unlucky in the timing of this war. The Frenchmen that he ruled were still as courageous as they were at the beginning of his reign. The problem was, where were his generals? Turenne, Conde, and Luxembourg were all gone. Only two French Marshals, The Duke of Berwick, and the Duc de Villars were to shine in this war, but not as brilliantly as those older diamonds had. Marlborough was close to winning the war in 1709, but his casualties at Malplaquet caused his allies to hamstring him. The Dutch were always an anchor around Marlborough's throat, and even more so now. The political fighting between the Whigs and Tories in England sealed his fate. Louis XIV, with the help of Villars was able to fight on, and managed to broker a much better negotiated peace then was thought possible a few years ago. The author shows this and more in this well done history of the war. 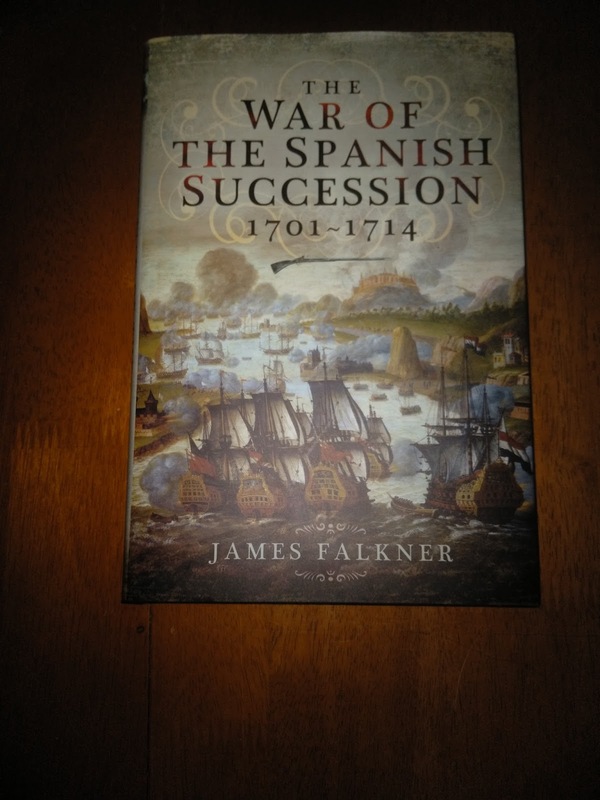 This book is a godsend for people who want to read about the history of the War of The Spanish Succession, but also the politics and warfare of the time. The author goes into all of the different areas of where it was fought. There have been a few books on Marlborough himself, and a few more about his battles. There have even been some on his entire campaigns, but none on the other parts of the war in recent years. To read about the actions in Spain and elsewhere, you have to spend hundreds of dollars, if not more, on some older books about the war and its personalities. There are some PDF and EPUB versions of these books, but the copying process has left them to be pretty much unreadable, at least to me. This book is an overview of the entire conflict and does not go into the minutiae of the separate battles or sieges. For those, you will have to look elsewhere. However, it does fill the gap in a book that brings the entire war to your finger tips. The author has a solid grasp of the history and reports it in a well done no-nonsense style without any hint of bias. I find this refreshing in a book about this war. Most of the books I have read on the subject have a definite English bias, at least in the amount of information about each side in the war. So thank you Mr. Falkner, and Casemate, for this book. It brings to life the war and its battles, and campaigns, and is a great addition to anyone's library.